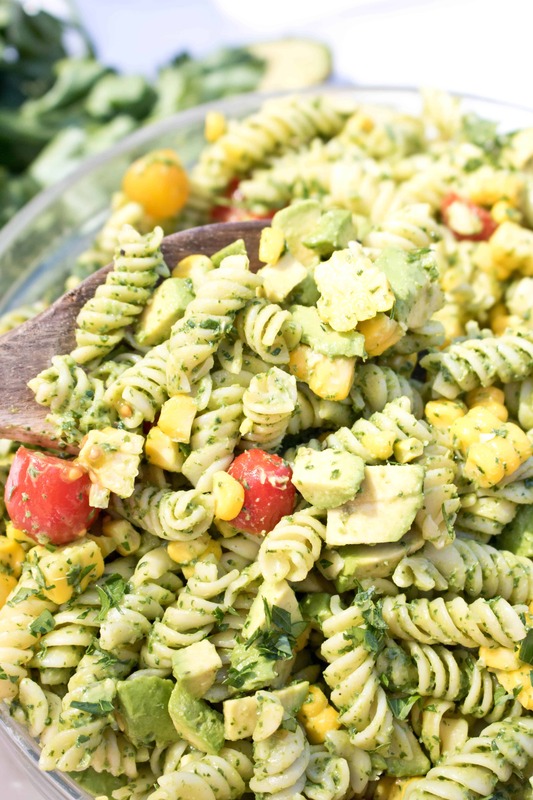 This Avocado Pasta Salad is one that’ll be different than all the others on the cookout table. It’s creamy, bright, packed full of (hidden) spinach, and it just happens to be vegan friendly! 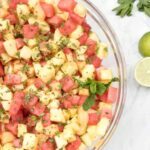 I love it when I’m looking for something quick and easy to make that’ll also be crowd pleasing and I stumble upon a recipe like this. 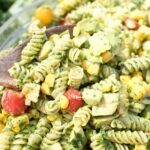 This Avocado Pasta Salad was fast to make and wonderfully different than your standard cookout side. Plus, it’s packed full of nutrition without tasting like it’s trying to be healthy! Fresh. Isn’t that what summer sides (ok let’s be honest, all summer food), should be? Yes. Yes it should. And since it’s fresh corn season, put in the little added work and make it with some fresh off the cob corn. You have all year to eat frozen corn, summer should be filled with fresh corn salads like this and our Grilled Corn and Pepper Salad! I’ll admit, there’s a sweet spot in my heart for those pasta salads. It’s what I grew up on! Plus, I already have a weakness to all things pasta. But all the fresh, healthy goodness in this salad makes me feel way less guilty about how much of it I ate. Plus, it made the baby happy – who’s getting ready to make his / her appearance any day now! M loved this salad. And it was definitely one I was more than happy to give her a second helping of! The sweet fresh corn. The pop of acidity from the cherry tomatoes. The creamy but bright dressing and just a kiss of fresh parsley? 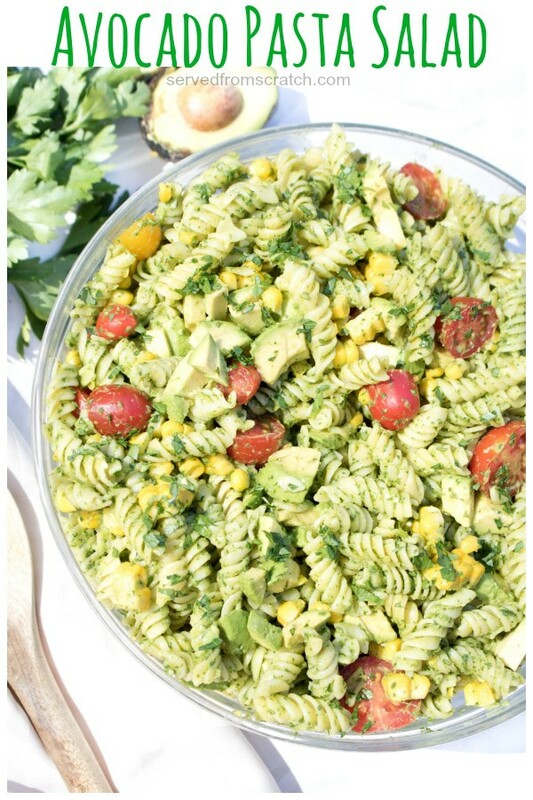 Avocado Pasta Salad: summer salad win! 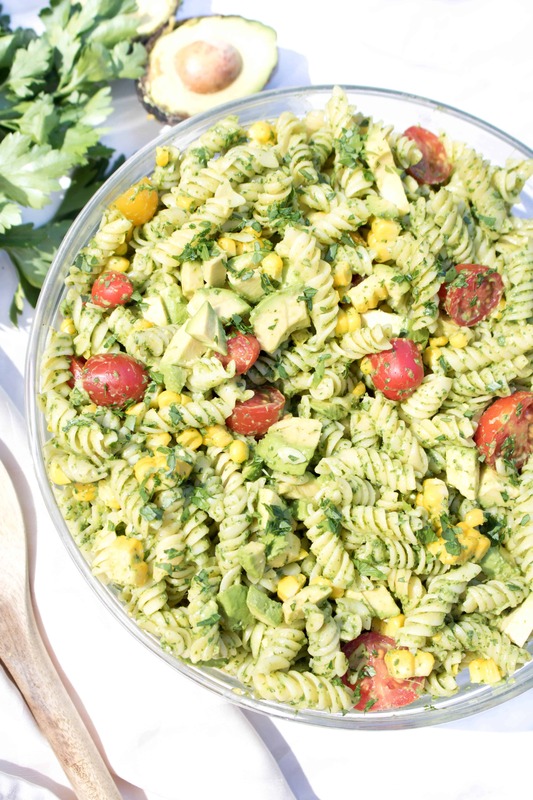 This Avocado Pasta salad is one that'll be different than all the others on the cookout table. It's creamy, bright, packed full of (hidden) spinach, and it just happens to be vegan friendly! Cook pasta by boiling in approximately 4 cups of water for 7-10 minutes until done. Run pasta under cold water, drain, and then add to a large mixing bowl. Meanwhile, in a food processor, add 2 avocados, 1/2 spinach, lemon juice, garlic, and salt. Blend and then add the rest of the spinach and continue to blend until creamy. Add tomatoes and corn to pasta, mix, and add avocado spinach mixture. Mix well, add more salt to taste. Dice the final avocado and add with parsley. Mix well and serve. Or make ahead up to 3-4 hours and cover tightly with plastic wrap and refrigerate. That avocado dressing sounds amazing. Can’t wait to try. I do agree…this will not be a duplicate at any party. I LOVE avocado, in fact we are having some in our dinner tonight. I will for sure make this for a BBQ party this summer. We all love avocado…and combined with pasta….so good. Bringing the same salad / dish to a BBQ is like wearing the same dress, isn’t it? ;P Hope you enjoy it! I’m really intrigued by the dressing for this salad — love the avocado and “hidden” spinach. 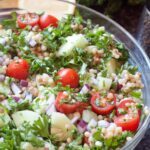 Is this the type of salad that you have to eat as soon as its made or will it last for a few days? I’m asking because of the avocado — and I know there’s lemon in the dressing which would delay oxidation, but was just curious how long it would last without browning — cause this would be an excellent lunch for my husband to take to work all week. I am a sucker of pasta salad. I grew up on it too!! I love that you added avocado and spinach. into it. I think this is the only way I would be able to get my son to eat spinach. I’m seriously always sneaking greens into meals because it’s the only way to get it into my kids mouth. Now this is the epitome of summer in a bowl. I absolutely love avocado and love finding new uses for it especially when I can hide veggies in it too! 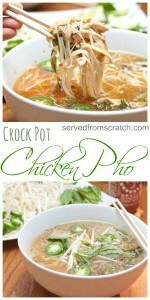 I can’t wait to make this and dine al fresco! 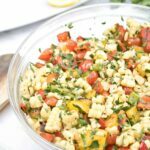 What a gorgeous pasta salad! 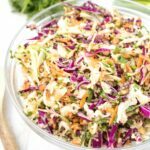 I love that you’ve made such a luscious, creamy dressing without any dairy! What a fantastic salad to make after a trip to the farmer’s market. 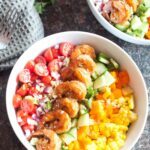 Corn season is at its peak here, so I’ve been looking for new recipes so we can enjoy it as much as possible while it lasts. This will definitely be on the menu during the week! 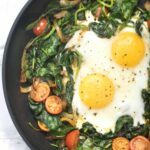 What a great way to get additional spinach in your dish. 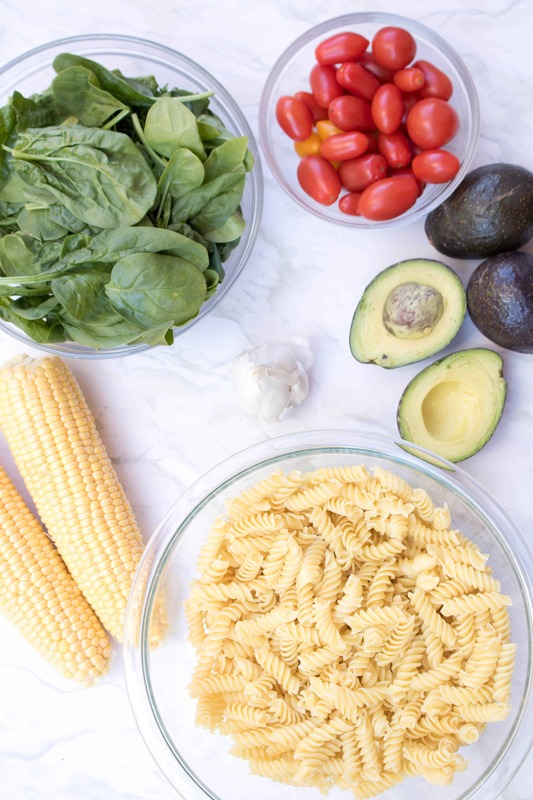 The pasta salad looks beautiful and we do love our avocados. I’m making out my grocery list now and will be picking up the ingredients to make this. I can almost taste the delicious creamy dressing now. That’s great, thank you Marisa! 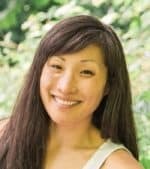 This sounds damn good, Tracy! I love how fresh and simple the ingredients are, and because I’m a total sucker for creamy pasta salads, I love how this one lets me indulge sans guilt. Avocados are magical. This could easily become a new summer fave! This is my kinda pasta salad! Delish!